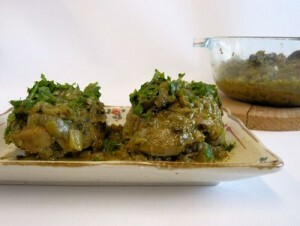 Chicken In Green Masala recipe by Maher at DesiRecipes.com. Take green chillies, yougurt, pudina, dhania, garlic /ginger paste, capsicum, and put in a blender. blend it well..
Now cut boneless chicken in one inch by one inch pieces and put this marinade masala into these chicken pieces. Keep in fridge for 2 hours. Now in half cup of oil, fry onions till brown..then add the chicken chunks and fry for 5 mniutes on full heat or flame. When you see the oil coming on top its ready. Garnish with green chillies and dhania and serve it with roti or rice. It tastes really good, worth trying.